Will Apache Corporation Raise Its Dividend in 2017? Given a huge find and rising crude prices, the energy company could deliver a long-awwaited payout increase. Throughout much of its history, Apache (NYSE:APA) has done a good job of rewarding shareholders by increasing its dividends, more than tripling its payout since 2005. Yet the collapse in crude oil prices in 2015 led to a pause in Apache's dividend growth, and although the company didn't reduce its quarterly payment, it hasn't moved it higher in nearly three years. Now that Apache has seen oil prices recover and made an important discovery, income investors hope that healthier payouts will come soon. Let's look more closely to see whether Apache Corporation is likely to raise its dividend in 2017.
Dividend stats on Apache Corp.
Data source: Yahoo! Finance. Last increase refers to ex-dividend date. N/M = not meaningful; Apache had negative earnings over the past 12 months. Apache has done a good job of keeping its dividends stable and growing them regularly over time. Throughout its early history in the 1960s and 1970s, Apache grew its dividends regularly. In the 1980s and 1990s, Apache contented itself with sustaining a flat dividend. That might not sound all that impressive, but given the huge volatility in oil prices over that time period, many small energy companies weren't able to match that performance. 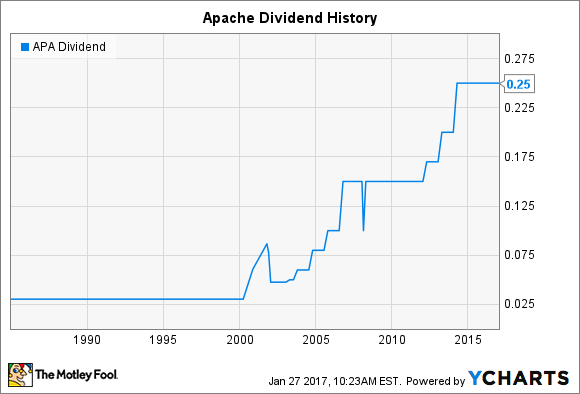 After a small hiccup in 2000, Apache then dramatically accelerated its dividend growth. Bumps in the dividend chart below show the impact of special supplemental dividend payouts that provided extra income beyond the regular quarterly dividends. The oil boom in the mid-2000s set the stage for the big gains in dividends that investors saw during that time. APA Dividend data by YCharts. When the oil market's foray to $150 per barrel finally reversed itself in 2008, Apache's dividend growth paused. However, the company again didn't cut its payout, and by 2012, the dividend was headed higher once again. 2015's bear market for oil repeated the scenario, but Apache proved its resiliency one more time by keeping its payout stable. Recently, Apache had some great news that could be the next catalyst for dividend growth. In September 2016, the company announced that it had a big find in a previously overlooked area of the Permian Basin in West Texas. Apache has major holdings in the Alpine High resource play, amounting to about 300,000 acres and making up almost a fifth of Apache's total exposure to the Permian. What Apache found was that in stark contrast to most of its competitors' impressions, the Alpine High area was rich in oil and natural gas liquids, which fetch higher prices than regular natural gas. The company estimates that two of the rock formations below its acreage could contain 3 billion barrels of oil, as well as 75 trillion cubic feet of natural gas. Moreover, several other rock formations could also have energy resources, adding to the potential gains. Apache immediately boosted its capital expenditure budget last year to push harder in the region, which it expects to produce for more than 20 years. The major concern is that there's little in the way of infrastructure in place because of the area's previous reputation as not being promising. However, Apache is taking steps to solve that problem as well. Will Apache raise its dividend in 2017? For income investors, the big question for Apache is how quickly it can start reaping the rewards of the Alpine High region. The company's early indications showed that it didn't expect full development of the oil field until 2018. That could put off the flood of new cash flow from the area, and that in turn could delay any decision to increase the dividend. Because of the need for capital to develop Alpine High fully, it's likely that Apache will hold off on a dividend increase in 2017, even with oil prices moving higher. Once Alpine High starts to pay off, though, dividend investors should expect better payouts for years to come.